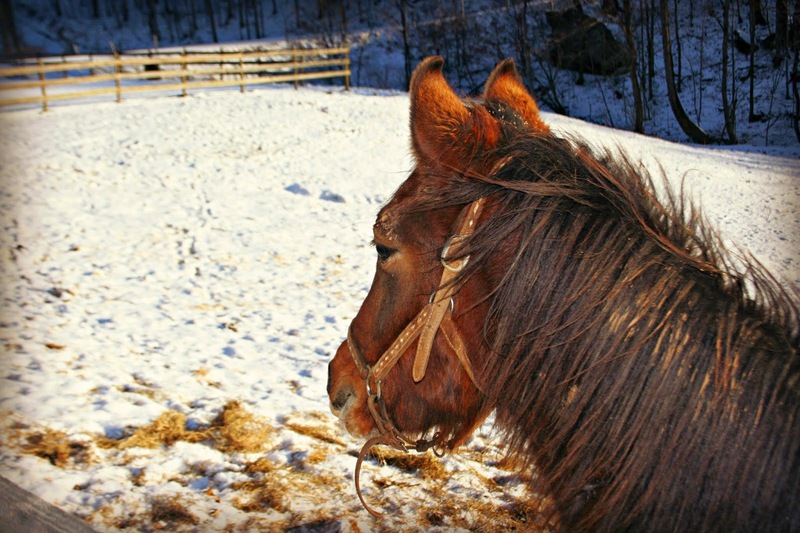 It has been a while since I've updated on Francie, our rescue horse, and a few of you have requested some news. She is doing very well. She's healthy. She's sweet. She still doesn't like anyone but me, but hopefully over time she'll learn that others can be trusted too. I try to work with her on the lunge line twice a week, although the weather doesn't always cooperate. She is doing well with being saddled. I bought a rubber dogbone bit which is very gentle, and some clips, and have started clipping it to her halter when I lunge her. The bit has been harder for her to adjust to than the saddle, but she's gradually learning to accept it. I also used an Amazon gift card to order her a very special bit for when I start to ride her. 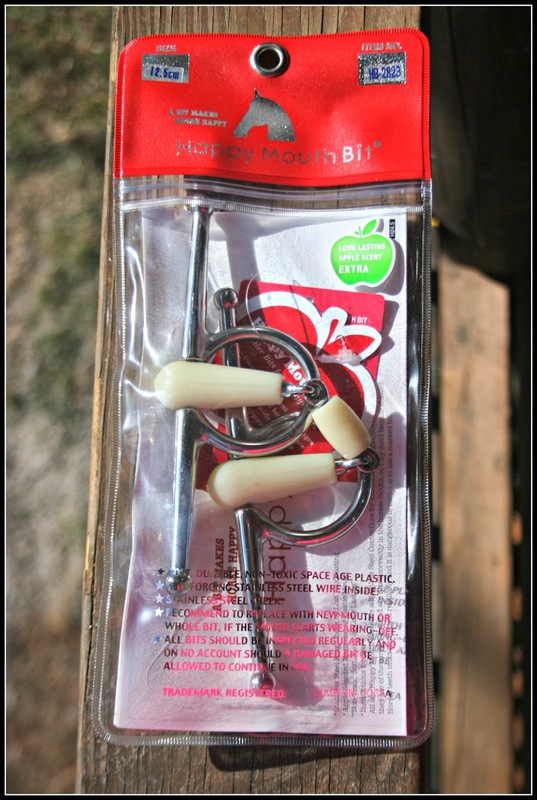 The Happy Mouth bits are expensive, but they are apple flavored with a soft cushion of rubber around them. My horse friend from high school, Michelle, who has amazing horse skills, recommended this particular bit. I decided it was worth the investment. I hope Francie will like it. Francie has been a quick learner. She leads well and doesn't pull on me, but walks right by my side. She listens. If I tell her whoa on the lunge line, she stops. She also knows the commands for walk, trot, and canter. She has learned how to load and unload from the trailer. It's amazing to me - this little horse that was sick and starving and couldn't even be caught last November has come SO far. One thing Francie still need to work on is trust - she doesn't seem to trust anyone but me, and is scared of others. I have started having Paul lead her some, so that she can learn that others don't mean to harm her. And if Pierce is around, I hold her while he gently pets her neck. She cringes if anyone tries to pet her besides me (but adores when I scratch her face and neck for her). I don't know if someone hurt her or not. But she's not skittish in other circumstances, so I am inclined to think perhaps so. This is something I think she can overcome, with time and repeated exposure to kind-hearted people. Francie is also still reluctant to be caught. I generally have to have food to catch her. As long as I have food, though, she is fine. I'm thrilled with Francie's progress so far. In the coming Spring months, I do plan to hop on her back and see where we go from here. Thanks to those of you who continue to root for her happiness! Delighted to read this update! It does sound like she has come a long way in a short time. It always amazes me what animals are capable of when they are given kindness and the opportunity to show who they are. I am sure that Francie will continue to do well in her new home. I am so glad that you have her, my heart breaks for the ones that are not as lucky as Francie. That is nice to hear, it will be nice to see spring photos of you working with her. The snow is getting near the tops of my 5 gallon buckets, I hope it has stopped. Thanks for the update on Francie. I am glad she is making such good progress. She sure does have interesting and pretty ears! Lisa, I think this is so wonderful- your kindness has saved her from certain death. I hope she continues to relax and feel the love you all are giving her. This is wonderful, so happy for Francie and you...gosh she has over come a lot and as you say has come a long way, so well done Lisa :-) big hugs to you and a secret pet and scratch from me. I'm so glad she's comfortable with you, and that she's learning to be comfortable with your family. And I'm so glad it sounds like she is definitely improving with training. Hopefully sooner rather than later you'll be able to catch her without food. Poor girl, though. So sad to think somebody hurt her. I've heard good things about those Happy Mouth bits. I hope it works well for you. Great progress. She looks like a sweetheart. So happy that Francie has a family to love her now. Wonderful that she is doing so much better. What wonderful news. You are a blessing to her! You may get two messages from me. I tried to leave a message on the link from FB but didn't seem to work. Just wanted to say I am so glad that Francie is doing well and so glad that you two found each other. I hope she will soon learn to trust Paul and the boys. Tender loving care can work miracles! I love hearing that Francie is doing so well! From what I've seen of people at different stables, the horse is right not to trust people she doesn't know. I once saw a local vet start beating a horse with a big wooden spoon when the horse wouldn't take some medicine. I just don't understand why people have to be mean to animals. :( I'm glad she has you. She needs someone that's patient and kind. dit is altijd meer dan de moeite waard. Has she ever had someone ride here? You've done miracles for her, it's nice that everyone in the family is helping too! What great news! I didn't know there were flavored bits. You are so patient and smart with her. Bless you both. I'm so glad Francie is coming along so well. She was waiting for you to come along, and is starting to blossom. What wonderful work you are doing with her, Lisa! That is such GREAT news!! Trust takes a long time...but with love and kindness, she will come around. Thank you for helping her. Our Tink was a very skittish shy rescue , but very smart. She is so devoted to me now and will try anything I ask of her now that she trust me. I am glad to hear that Francie is progressing. I think spring's arrival will make things easier as well--and it will be applauded by all after this winter of yuck. Sounds like you are doing a great job with her! Keep up the good work! She is a beautiful horse! Nice to hear about the health of her. Great work to train up a horse. I like Francie! She looks like a lovely horse. I love horses! Thank you, Lisa for helping horses and other animals! You are a super woman, sweetheart. Francie looks wonderful! Thanks for the heart-warming update. Oh, how I love a good news post! Thank you for the update; you are such a kind and patient person. Good work. Sadie cat can only be handled by hubby. I'm too impatient. Good for you. Lovely story. She looks so good in the picture! You are such an amazing soul. It definitely sounds like she is making a lot of progress.